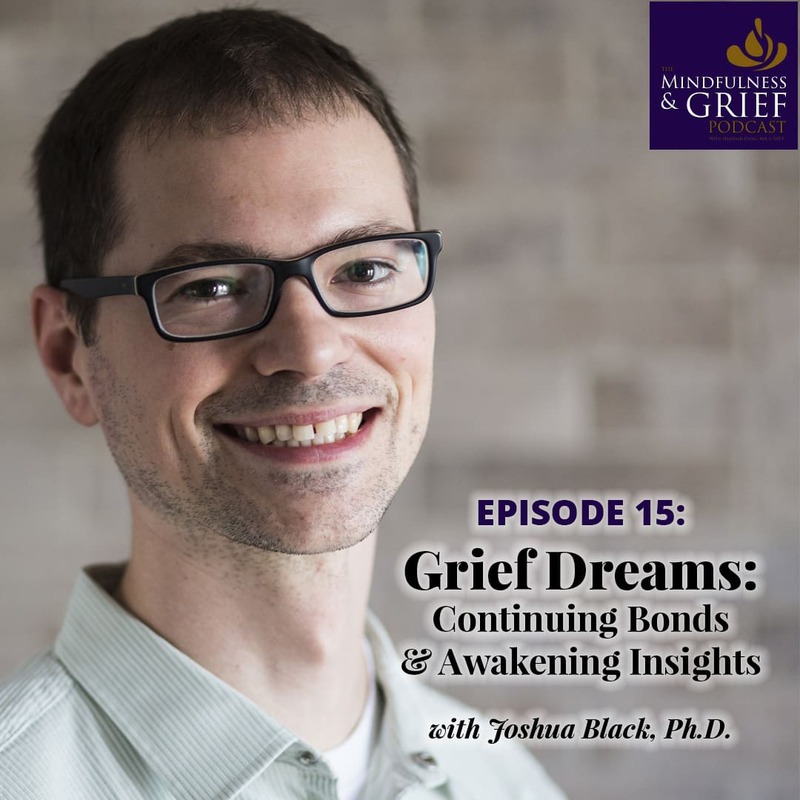 In the fifteenth episode of the Mindfulness & Grief Podcast, we dive deep into the world of grief and dreams with author and grief dream researcher Joshua Black, Ph.D. If you have ever wanted to know more about your grief dreams, or have wondered why you have not had one yet, this episode is for you. Dr. Black shares the three different types of dreams that occur after loss, plus the different themes that have emerged in his studies of spouse/partner loss, pet loss, and prenatal loss related dreams. You will also learn tips and techniques that can help both children and adults use their grief dreams - or desired grief dreams - to do very important grief work. 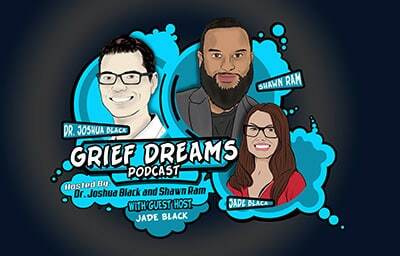 Learn more about Grief Dreams at http://griefdreams.ca, and be sure to listen to the Grief Dreams Podcast, hosted by this week's guest, Joshua Black, Ph.D.
Or Ask Google Home or Alexa to "Play the Latest Episode of the Mindfulness & Grief Podcast." Heather Stang: 02:16 Welcome to the mindfulness and grief podcast. This week we will be talking about grief and dreams with Dr. Joshua Black. His research interest is in the area of grief dreams and he has a special focus on dreams of the deceased. He recently finished his Ph.D. in psychology at Brock University and has published scientific literature in this area and is considered one of the leading academic researchers in the field. 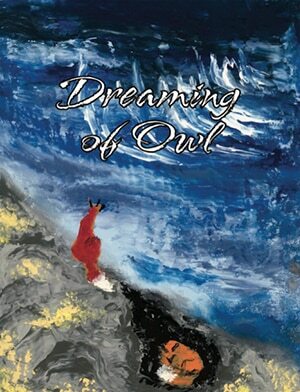 Joshua has written a book on the subject for children called Dreaming of Owls, Dreaming of Owl singular, because it's a specific owl, and it's a story of two foxes and their experience with dreaming of their deceased friend. I actually did pick this up on Amazon. And not only is it beautifully written, but the illustrations are very evocative of dreams. So, thank you for putting that out there. And so that book can be found on Amazon as I mentioned. And you can learn more about Joshua's research at http://griefdreams.ca, and he has an Instagram and Twitter account, which will be in the show notes that you can look for: @griefdreams is his handle. There is a Facebook group and a podcast. So those of you who are listening to this podcast, if you are an avid podcast consumer like myself, check his out. So Dr. Joshua Black, welcome to the Mindfulness & Grief Podcast. Joshua Black: 03:55 Thank you for having me. Heather Stang: 03:57 So this is a topic that comes up all the time in my grief groups and even just talking to friends who are bereaved. And one of the interesting things that happens in a group is some people will have had grief dreams and some people won't. And that can bring up a lot of, questions and curiosity. And I'm hoping we'll dive deep into that. But first off, can you just tell us what grief dreams are? Joshua Black: 04:28 So there's a couple of things. It can be, the one thing that I'd probably, we're going to talk about is the dreams that happen after the loss. And so there's three forms that I've sort of turned to. The first one is, dreams that are representative of the emotions of the loss, but they don't have the deceased in it. They're not mentioned at all by anyone in it. So it's just like, let's say you're running by a mountain, the mountain collapses on you, just represents the heaviness of waking life, so the second one, second form would be those dreams that don't have the deceased present, but people in the dream mentioned them, or there's symbols of them in the dream. So one would be, let's say you, I've seen ones where it's an angel that mentions the deceased in some fashion, or it's friends or they visit the hospital where the father died. So something like that. And the third one is what everyone wants to talk about, and this is what I've done most of my research on is a dream that has the disease actually present in the imagery, in their regular form, a human form or pet form, or in their essence. So I had a couple dreams where it's like a cloud, or it's an animal that they know it's their loved one. So it was just like they're there in the a scene somewhere. Heather Stang: 05:37 So it's like you know it's them, but they don't have the same physical attributes or may not even be the same species or a species at all. Heather Stang: 05:46 What got you interested in this by the way? Because it's a very fascinating field, but I imagine not one you just trip over. Joshua Black: 05:54 No. Yeah, I wouldn't have chose us. So, I guess you have to go back to the beginning when I was in my undergrad and I actually want to be a elementary school teacher, and then my father suddenly died, and with that became so much sorrow, a lack of joy. It definitely changed my world around. It was the first time someone that I really cared for died. So it was a huge shock. And the world changed and it was only three months after I had my own dream of him where I got a chance to say goodbye and then I loved him. And that was something that in waking life he died very suddenly. He was supposed to pick me up for a hockey game that we're going to go to. He just never showed up. And I think, you know, looking back on that, that dream, it unlocked some stuff in me that I, I think I wanted to, don't want to say goodbye. Joshua Black: 06:47 And I, you know, as a man, I didn't really say I love you to another man too much. And my dad's one of those guys I never did it too. And so it was those two things, when I woke up, everything changed in my life. Like the, the joy came back, like life was in color again. It was the one of the craziest things I've ever experienced because of the whole 180 of the emotions and the emotions of joy stayed. I still was able to have sadness and stuff, but the hope was back in me and like the motivation of life. And so I always kept that in. I never told anyone. And so I can't even say it's because of my own dream that I started the research is because I started then volunteering. So after, after school was done, I actually didn't feel like a wanted to be an elementary school teacher anymore because that's what my Dad's vision for me was. Joshua Black: 07:40 And because he died, I almost felt like I didn't need to do that anymore. It's really, really interesting. So I took a year off and I'm like, what do I want to do? I'm like, well I love helping people. Let's volunteer at a local hospice and you know, work with the bereaved. And so when I did that, I was, I did one on one and group, and people kept talking about these dreams that they had and there are different than mine. Some of them were negative, and some of them, as you said, they, they want to know why they haven't had one. And I looked at the literature being a good academic and there wasn't anything there that could help them. And that's when I said, well, either I go back to school and figure some of this stuff out or wait for someone else. Joshua Black: 08:19 And I'm not a patient man when it comes to looking for answers. So I'm like, I'm going to do this myself because if it's been this long and there's nothing, I can only imagine how long it's going to be for someone else picked up the reins. So that's when I said I wonder what schools are around, and where I was living at that time, Trent University actually had a dream researcher and so I did my masters at Trent and then went to Brock University and did my Ph.D. looking at basically from the ground up what these dreams are. Heather Stang: 08:44 What has your research revealed? I know that is like asking you to give us your life's work in like five minutes. Joshua Black: 08:50 How much time do you have? Joshua Black: 09:13 So I'll just go with my masters. A couple of things I found was there were these common themes that people had, which I didn't really know much about. So, some of them are positive and some of her negative. So that was new to me that there was a sort of mix of two, because I've only had positive ones at that time, and so it's interesting to see the different types of dreams. And also the other interesting thing that I found in my MA was dreams tend to change - I looked at an individual's dream diary - and those dreams change over time as she claimed she was getting, was releasing some of her grief. So, you know, with those two things, I then moved to my Ph.D., and that's where I really got to ask the questions that I always want to ask, which was how common, is it common to have these dreams? Why are people having positive dreams versus negative and why aren't people having dreams? And that's the question you get. So that was the main three questions that the bereaved asked me, but I wanted to get that groundwork to then be able to look at it for my Ph.D. So I'll go through each one of those, I guess. Joshua Black: 10:21 ...and then we're done for today! Heather Stang: 10:22 Yes, right. Okay. So, tell us more. Joshua Black: 10:25 So what was really beautiful about the research I did was it wasn't just with like, adult loss. So I did do that. I did look at spousal and partner loss, but I also looked at pet loss, and I looked at prenatal loss, because those are disenfranchised griefs. So I wanted to bring up a little bit to the general public and what better way to do it then tie it in with the dream to see like are they similar to spousal loss, which gets a lot of airtime in our culture. So I looked at the dreams, so when it comes to, the frequency of these dreams in people's lives, so the prevalence, the first thing is that for spousal/partner loss, within the first year or two, 86% of people, stated they had one of these dreams, which is almost everyone. Heather Stang: 11:17 Almost everyone. And that that seems to be kind of in line with, when I run a group, you know, it's probably around 70-80% of people report maybe having something. And then there's the one or two people sitting there going, why haven't I? Which we'll get to your third question, which is a big question we have. It's not that surprising, I guess in a way that of course that many have it. But I guess what is surprising is the percentage that don't. Joshua Black: 11:42 Yeah. Well, even that, I was surprised that that many had it, because there's no research on it, and there's more research on guilt, which you know, probably has less people feeling that after loss. Heather Stang: 11:55 In your methodology, there are people who don't dream, or who don't remember their dreams. So were you working with people, wh, were anyone, or was it a set of people who knew that they typically remember their dreams? Joshua Black: 12:09 That's good. Basically anyone. And in our advertisement of the study, it was actually advertised as a grief study, not a dream study. So none of our results can be stated to be because it was a dream sample, like people who were interested in dreams. It was actually just a grief sample, which was the surprising facts of these numbers are actually more probably more generalizable than any other kind of study when it comes to this, which is fascinating. And so when are looking at pet loss, 70% within the first six months had a dream of the deceased pet, and prenatal loss, it was 60% within the first year. And that is very different ways and we can talk about the differences of those dlater on. But that's like that's a lot of people having these dreams and the frequency can be from once, and that's all they get. Or it could be a couple of times a month. So there's a lot of variability in how many dreams they have per month, but the fact that so many people are having just one dream, should like raise a lot of questions in people's minds. I'm like, what's going on here? Heather Stang: 13:12 Right. And one of the things that... Maybe I'm jumping ahead a little bit by kind of going back to you talking about positive versus negative dreams. One thing I read in the afterword or your children's book was that a lot of times the mood, the emotion of our dream reflects what's happening in our waking state. And so of those 86% did you say of of partner loss - and I'm interested in the other ones as well - did you find that there was a ratio of positive to negative or did it, I guess it was fluid probably changed over time. I would imagine. Joshua Black: 13:55 You would think the really interesting thing about dreams is, as you sort of mentioned, that dream for reflect our waking life, and that's called the continuity hypothesis. So we would expect after loss because we're having so much sorrow and so much grief that our dream should be negative in nature. And this is shown just in regular dreams, like on average where you have more negative dreams. So if you'd like sample someone, they're probably dreaming something negative in general just because life is so stressful. And then after trauma they're even more negative. So you would expect after grief you'd have these negative dreams. But what's fascinating and makes these dreams so special is that predominantly these dreams are positive. So out of that sample of said like 86% of those people had a dream, of that, or 92% said it was a positive dream. 40% stated they had a negative dream at some point, but what's interesting is that of that 40%, 38% of that stated that they also had a positive dream. Joshua Black: 14:53 So people who have negative dreams are tending to have positive dreams also, which you know, makes me think that maybe they're having negative dreams in the beginning and as they work through their grief, then it becomes more positive as those things kind of worked out. But the essence of it all is that it doesn't follow the pattern of past research when it comes to dreams because of the positive quality of these dreams. And I'm thinking that's why people love these dreams so much because when I talk about it on my podcast, or wherever more, you're more likely going to get a positive dream that comes into their mouth. And so what that means to them is a very beautiful thing. Joshua Black: 16:35 So yeah, I can answer that. We're all dreaming and we're dreaming in REM and Non-REM. So the question is, you know, why are we, why are some people better at remembering dreams than others? And so they haven't figured that out yet, but they do know 10% of the population doesn't remember their dreams, but they have found out that they are dreaming. So like we're all dreaming. It's just like why are some people remembering it more than others? And so I'll actually lead into why some people don't remember their dreams, or some people don't remember their grief dreams and others do. So we looked at what factors predicted dreaming of the deceased in spousal loss and also pet loss. And what was interesting is we got to replicate what we found, which says a lot, especially in research. Joshua Black: 17:21 So we looked at different personality traits like openness to experience and attachment. So attachment anxiety, attachment avoidance. We looked at grief, looked at age and gender, but then we also looked at dream recall frequency. So how often do they remember their dreams in general? And what's really interesting is the only significant predictor in both studies was the dream recall frequency. So it's saying is that people who remember more dreams in general tend to have more dreams of the deceased, which makes sense. It makes logical sense. And those factors like grief or attachment or openness to experience, they can affect your dream recall. So it's almost an indirect way of increasing your, your dream recall. So it was very fascinating to see that because it gives an answer to a lot of those people who want to have these dreams and don't. Joshua Black: 18:13 And I've seen so much when it comes to the complications that brings, as you saw in group, I've heard people say they don't have a dream that either their deceased loved one is, didn't make it to the afterlife. So maybe they're in hell or they're in purgatory and they were wandering a lost soul somewhere. Or maybe they did crossover, but you know, maybe they just don't love him anymore. Maybe they're mad at them, they're holding back their visit. So there's all these complications people give to try to understand why they're not having this experience. When it really could be the, they're not just remembering their dreams in general. And a lot of people I've come in contact to after who've asked that question, I said, well how often do you remember your dreams? And they say, oh, I hardly ever, I said, well, how are you supposed to remember one of these dreams? They're like, oh, I never thought of that. So people want it and they don't understand they need to remember dreams to almost get it. So at the end of the day it gives me like a scientific explanation to say no, it doesn't mean that they're mad at you. Joshua Black: 19:09 It doesn't mean that they're in hell, like there's, there's other explanations here that we can look at, and it seems to help people and there's different ways to actually increase your dream. Recall that, you know, research has shown. Heather Stang: 19:20 Tell us more about that. And before you go into the science of it, I went through a period recently, there isn't any particular grief happening in my life, where I feel like there was probably eight months where I wasn't remembering my dreams. And then I started writing again, like just creative writing. And all of a sudden I'm having crazy vivid dreams. So I don't know, that's my own non scientific research. But when we started talking about you presenting this, I was like, Oh I wonder if there are things people can do to help recall that, to help bring it to the surface. Again, as you said, I was dreaming, I just wasn't remembering. Joshua Black: 20:01 Yeah. And it's interesting what we remember and why. There's something there, that we're choosing one dream of all the rest that we were having to remember. So anyways, the one thing you can do is to value dreams. And a lot of people in our culture don't, so therefore they go to the waste side. So the mind may sort of have a inclination but it knows when you're waking up you've already told it that you don't want, you don't care. And so like after a while their minds as well, there's no point even like putting this into memory. So what you can do is actually start talking about it and start writing about it. Keeping a dream journal is beneficial because what you're saying to yourself is, I want to remember these dreams now, you know, before I didn't, now I do. And when you do that, it's a fascinating how fast those dream can come. And you'd be like, oh wow. Like I remember. So some, even if you just have like a thought or word in the morning, just put it down, and just start training yourself by doing this. By valuing these dreams. I remember when I first heard this and like saw in the research and like, oh that's interesting. I'm going to see if I can try it. Cause usually I have maybe four dreams a week that I remember. And so I started doing and I started having like three or four at night and I'm like, I gotta stop. It kept waking me up right. And I'm like, and then I write it down and try go back to bed. So I've stopped doing that. I've only worked at like write down my more important dreams. But at the end of the day, that's something people can do actively do to help that. Heather Stang: 21:27 I think that is so relevant to mindfulness. You know, we talk about mindfulness and grief. The whole point of being mindful during your grief is so you can control the things you can and let go of the things you can't and you know, grief/ loss is such an uncontrollable disenfranchising experience. But when you can start to take care of yourself, that's huge. And even being able to say, I have this intention of paying attention to what's happening, it's fascinating, and just what's happening on the backend of the brain, to help you retain that information... My consciousness is overwhelmed by that idea. Joshua Black: 22:13 And we're just getting started. Heather Stang: 22:15 All right, are there other things people can do to help themselves remember their dreams? Or is that the primary? Joshua Black: 22:24 That's the biggest thing. And then when it comes to grief dreams, so I always ask people after, if they say they want one and they haven't had one on the podcast, I ask people, so what dream would you want? And it's fascinating to see people say, I don't, I don't know. No one's ever asked me. And like they would never asked themselves either. They want it so bad, but they don't know what kind of dream they want. Cause there's, I've seen millions of dreams, you know, so what dream would you want? You have anything? And so that's that mindfulness is sitting down and saying, what would I want? But what would be the best for me at this moment in my time? And so actually, that's a question we asked people at the end of our podcast and it's amazing the answers you get. And so if people want to go on the grief dreams. ca website under the Grief Dreams Podcast tab, there's actually a worksheet that people can actually use to fill out and basically guide them to put together the best dream that they want to have tonight if they could. And some people said that it has triggered a dream, which was really interesting. But you know, I haven't actually tested that. Heather Stang: 23:26 But even if you, even if it doesn't trigger a dream, you're still doing some really good grief work there because you're thinking about how you want to relate to your loved one, to your person, or how you want to relate to your grief experience. So that's still very valuable. Joshua Black: 23:40 Beautiful. And I've, I've used it in group and people have used it in group and it's one of those things that you can bring to a group or to a large population and say not everyone has had a dream but we can all have a dream tonight and always make up this dream that we want to have tonight. And it allows people to be a part of the conversation because I think the issue with bringing in grief dreams with groups that I've heard is that people feel isolated, and this allows everyone to be connected again through what dream they want to have, and it is amazing the emotion that comes out. I see it just another way of talking about the loss in a more creative fashion. So usually when people talk about loss, it's like they have like their whole stick on like, who died, what happened, this/that. When you build a dream, you're putting in a lot of stuff that you haven't told anyone, like what did they look like, what kind of clothes they wear, the location of the dream. All that stuff is something you wouldn't normally have talked about. And they all have stories. And so I love the fact that someone could talk about this dream that they want to have, and that starts a conversation into other aspects of their grief and loss that they may not have talked about before. Heather Stang: 24:48 In your book, Dreaming of Owl, the story itself is beautiful. And then at the end you give some really specific and very helpful advice for parents or people working with children who are grieving to work with their dreams. And I think that that is something that I would love for you to talk about. Not to give away the ending of the book because I want everyone to run out and get it. But so there's some really valuable tips in there working with children if they have an upsetting dream, of if they, if they don't. Joshua Black: 25:22 Yeah. Well thank you for reading the book and I appreciate the positive feedback. I think a lot of people forget, because I said that the lack of research out there, so almost because of the limited research, no one really even thinks kids have these dreams. But they do. I have one study that actually looked at it, and 50% of the children reported having one of these dreams and some of them were positive and some of them are negative. So that's why it's so important to know what's going on in your children's nighttime. You know, like what and how can we talk about this? Because a lot of people are afraid to talk about these dreams. But one of the themes that I found an adult dreams is a sort of reoccurring of the deceased saying that they're not dead again or that they've, they were hiding and now they're back, kind of thing. Joshua Black: 26:09 And so kids can also have this kind of theme and it can confuse them. Even just having a loving dream can confuse them and because of like between the ages of two and seven, you're in that magical kind of thinking stage. And so I can only imagine what they think when they have one of these dreams. Like did he really die or did they really die? Like what's going on? Is he really hiding? And so it's really important to ask your child what they're dreaming and then how they feel in the dream, but also afterwards, and like what parts made them feel, you know, happy or sad or, or confused or frustrated. And you talk about that with them. Because if, you know, I said I like the continuity hypothesis. If you just know that these dreams reflect in some way of what they're going through, it's easy to put the two together and maybe what they're feeling and maybe not sharing and what's actually going on in their grief struggles. Joshua Black: 27:02 One of the favorite dreams I've read when it comes to children, was she, this, this, this girl had a dream of her deceased friend. And when you ask her, so what happened? Oh, I saw here in this tunnel. And I asked her sort of, how heaven was, and if she was making new friends and she said yes. And we just chatted about what was going on my life. And then I woke up. And I said, isn't that interesting? It was the first time I ever saw someone's concern of, of the other, like the deceased, if they are making friends. I never had one adult yet to this day say, I wonder if my deceased spouse is making any new friends. That was a part of the concern that the child has, and it's nice to know just by seeing that what children are morning and are grieving and are worried about, and what they're not. And so yeah, there's so much that I could talk to her about that. but that's sort of the major part is just opening up the dialogue and not trying to interpret the dream per se, but just talking about it because the emotions tell the story. Heather Stang: 28:05 You bring up such a good point about the magical thinking period and how most of us have woken up with a dream where were we still feel like we're in it. We feel like it's very real. And, and for a child where their brain hasn't quite gotten to that point where they understand that death is permanent thing, I could see how how a grief dream could really create that ambiguity. And so as a parent or a grief professional, helping them find that ground. Talk about reframing, because I think that was a really important piece with children is reframing a dream. Joshua Black: 28:46 Especially if they have nightmares because people can become very afraid of the nightmare. And then what can happen with children, adults is then they're afraid to go to bed. And so they start restricting their sleep. And what that does is actually provide more negative dreams because now they're sleep deprived and they're anxious going to bed thinking they may have one of these dreams. So a great tool to use for adults and children on if they have one of these dreams is just reframing the dream and changing the ending. So it's called dream rescripting, and it's been shown to help reduce nightmares in literature. And really what you're doing is you're taking the dream, and you're allowing it to, there's a couple of ways you can do it. One way is you allow the dream to play out as it did and then ask the child or the person, how would you want to change the ending to make it more positive? And so you could do it that way. Joshua Black: 29:50 The other thing is you could add a character like, you know, like Batman or someone else to help you through that dream. So it's more positive. And what's interesting is that when people rehearse these dreams, those dreams fade away. And I think the biggest thing is you're not avoiding the nightmare anymore or the dream because now it's not a negative thing because you've changed it. And what's so interesting is when you can take control your dreams and waking life for some reason, your mind doesn't sort of need to remember those dreams or maybe even have those dreams while you're sleeping anymore. So there's something really simple about just changing the ending. And I, it's funny because I've done that all my life. I just never knew what I was doing, because I would wake up from a nightmare and I be like, oh, I wish I would have done this instead, and then play out what did I would have done instead? I never really had that same dream again. But it's interesting. That's actually what you're supposed to be doing. Heather Stang: 30:43 So you had this intuition to do that. And as you're saying that, I wish I had known that my entire life. So thank you for sharing that with so many of us. For people who are listening who maybe haven't had a grief dream or maybe there are people listening who haven't had a major loss yet. Can you talk to us about why these dreams brings so much comfort to the dreamer? Joshua Black: 31:09 Yeah, so one of the big things is because it provides a continuing bond, that's one of the reasons and providing a continuing bond if it's comforting, can actually help with the grief process. And these dreams are just, it's hard to really explain how powerful these dreams can be, because it's not just like you're having a positive dream. Because I think in most people who've had dreams, those who have had positive dreams, a lot of these dreams tend to be even more special. There's like an almost a feeling of love within these dreams that can't compare to anything else that they've had before. And so the feelings of love, but also seeing the loved one again in a healthy way. You know like that's something usually our last memory is they're dying or they're dead, you know, like in the coffin. But now our last memory that we have with them that actually is a positive image of them smiling, healthy, looking better and that provide you that comfort that your mind can say, oh I'm going to remember that part of them. I remember that aspect of it. And to also help with that continuing bond of maintaining that and if you're spiritual that means like a lot of people say to them it represents feeling loved, that they're still being taken care of kind of thing. But also they have crossed over and that's like such a major part of, I think people who are spiritual, they want to know that, they want to get that one thing. And a lot of people have told me, or bereavement counselors have told me, that people who don't receive dreams, those are the people that tend to go to mediums and stuff, if they're spiritual cause they're looking for that sign that they sort of crossed over. I think that's really interesting that these dreams are providing people with that kind of reassurance and to almost allow them to believe more in what they believe in, so that the afterlife is real and all that sort of stuff to help them with the transition. Joshua Black: 32:52 Because one of the things you know, that our faith, that people who are spiritual, their faith can be really hindered through a loss, and this can actually help them, my research showed, that majority of people who've had these dreams, actually believe more in an after life because of it. So it just allowed that extra thing for them. And then remembering old memories. I know one of my biggest fears when my dad died was I wasn't going to have any new memories of him, and I was going to forget the old memories. So I was so panicked, I started like writing down all those memories, and I was so sad because I couldn't at will remember all those memories. But I had dreams and I've had people contact me and say, I just remembered a new memory because the dream I had, and I think this is another beautiful thing where it can bring for those people who even aren't spiritual, they'll have these dreams and they can remember some of the times we had together, they can remember how they sounded like, what they smelled like. Joshua Black: 33:45 It's very fascinating on people can things that people long for, they can sound kind of get spiritual or not. And the beauty of it is people change. If people can change from these dreams, like nothing else I've seen before, it's not just like it's positive, but a lot of these people spiritual or not doesn't really matter. Like your belief system doesn't really have a impact in this stuff. I think the dream itself allows people to almost have that respite from the grief and it changes them. so like what happened with me when I woke up, like things were different. It wasn't anything I did. It was something in the dream that, whatever that respite was, it could have been that meditative love that was present that when I woke up I was able to sort of look at the situation a lot differently. Heather Stang: 34:30 Definitely. What's the word? Not reiterates but comforts us by letting us know the love is still there. That is one of the most healing things for loss, is knowing the love is still there. We long for their physical presence, but the dream can still build that emotion. You wake up from a dream and you feel, you still feel love. I'm curious. We talked about spousal/partner loss. In terms of the other types of losses you've studied, have you felt like across the board the themes? I mean, I know every story is going to be different because every loss is different, and every person is different. And then we throw in the fact that it's a dream, which just makes it wide open, because you can float and fly and yeah, physics is just gone. But in terms of prenatal loss or pet loss versus spousal loss, are there any qualitative or narrative differences, or are they fairly similar? Joshua Black: 35:42 Yes. So for spousal loss, what's interesting is there is a lot of talking. It is one of those things that you do a lot of it as a spouse. So you see a lot of that communication going on there. When it comes to pet loss, what you normally see is you have the positive or negative. So that's across the board, positive and negative types of dreams. But when it comes to, so pet loss, some of the positive dreams are just walking the dog, or cat or the cat sitting on your lap watching TV or on the bed. So very simple images and they're almost like memories. But your life with them is so repetitive. Some people say it's a memory, some of the people say, oh no, my dog came and visited me. I'm like, oh cool. You know, like, so that's really interesting. Heather Stang: 38:08 I was really glad that you looked at the partners because you're right, you know, this type of loss is disenfranchised. And then it's almost times two when you're not the person who carried, you know, who carried the child. And not that we're saying either one is better, worse or harder or not. It's the fact that it doesn't get talked about. And so I think this might be a good moment as you said, to bring the disenfranchisement into the light. So what did you notice about the partners? Joshua Black: 38:38 Well, some of the negative dreams, it's just so sad to see. I remember the one dream was the, the mother was picking up the child and then gave it to the father. And then what, what was given to him was just a bloody sort of wrapping of what, what used to be the child. So he wanted to scream. He wanted to call for help. But nothing came out of his voice and he felt like he was stuck. And like in that dream, I would definitely talk to that person and say, you know, is there a place that you are able to voice your grief? Because it seemed in the dream that he doesn't have a place to talk about it, and I think a lot of fathers or partners, they may not want to talk about it cause it brings up so much emotion in the birth mother. So they try to like be the strong one, you know, and hold it in. But they have their own stuff that they got to deal with these, that dream itself. There's has so much rich detail on a topic of you know, what's going on in that person's life that should be talked about. So these dreams can hopefully be more pleasant in the future. Heather Stang: 39:45 So the dreams not only evoke an emotional state in the dreamer, but for professionals or friends or family members who are talking to other people about the dreams, it is really a opportunity to integrate the message of the dream, the imagery, the iconography, the symbolism into what do you want to do with this? What do you need, and so for that, for that partner father's case, it's, you know, so obviously a voice, him not speaking. And so, you know, then the question is, what do you want to do with that? And I hope so many people that are starting to pay attention to their dreams, not only let it stay in the dream state or take it out into their life and into their grief work. Joshua Black: 40:34 Yeah. And I think these negative dreams that people do have, it's don't be afraid of them. I like actually look at how it relates to your waking life. And maybe it's saying something that you're avoiding, maybe doing in waking mind. Maybe there's something that needs to be something that you could do to help facilitate your grief journey a little bit better. And when it comes to negative dreams, I do want say one thing. When I looked at the research on why we're having positive vs. negative dreams, negative dreams were related to post traumatic symptomatology. So people who had a traumatic death were the ones who were reporting these negative dreams, and also people who had unresolved feelings of guilt or blame. So that in itself, and every time someone's brought negative dreams, those are the two places I go to. And it's amazing how it's like, yep, okay, that makes sense. They can relate to it so strongly, especially with the guilt and blame. It's just like, it's so prevalent in the imagery and just saying like, you need to work on. Maybe you don't want to, it's your mind saying you need to. Heather Stang: 41:40 With ambivalent relationships or ambivalent attachments, family members where maybe we were not speaking to them at the time of the death, even if their death wasn't traumatic. Do you find that that the negative dreams show up in terms of that guilt or unresolved feeling? Joshua Black: 42:03 Yeah, the unresolved feeling, it's huge. And, you know, I said the regrets that we have, one of the dreams I share a lot when it comes to getting people to understand how it relates to waking life, was a, there's a, a woman who lost her husband, and her husband came to her and in very negative fashion saying, you know, I'm back from the dead and I want all the money that you inherited. And she's like, what? Your dead, how could you do this to me? And you know, and went on. And he became very angry with her. This is a repeated dream for her in her life. And when you look at the imagery, the biggest thing is, is it actual reality? So was this person a mean person to begin with? And the answer is no. So she said he's the most loving person. So it didn't make sense to her on why he was coming back. She saw as a visitation. So it was like a haunting almost. Why he was coming back and demanding all this money. What she did say. What's interesting is that the, the money that she inherited, she felt guilt for having, it was almost like he had to die for her to have that. And she felt so uncomfortable with it. And so like I would never have thought of that. Like having money and being uncomfortable with it. But when you see that dream you're like, wow, that's the thing that you need to talk about and need to work through, hopefully with a friend or a therapist, to work through holding that money. And so to allow yourself to feel his love or do things in, in memory of him without being sad. Because I can only imagine, maybe he was the one making the money to begin with, you know, a lot of the money. And so now you have to pay your bills, you go on trips, you gotta be able to see that have a sense of love rather than a sense of sadness to facilitate your growth. Heather Stang: 43:57 That's the benefit finding part of meaning making, which is an interesting piece because in, in meaning making, we have sense making, which is how do we make sense of what has happened, how do we make sense of our life? And then there are the benefits that we've received, and you can have all the meaning making/sense finding in the world and have a, I don't want to use the word positive but, but a, your grief experience will be helped by that. But one of the pieces of the research as I understand it, is that if you have too much benefit, then what you're saying with this lady will happen, where there is that guilt. And I know even in my experience when my stepfather died and I wound up with his, his camera and I now love that camera. Small thing, not lots of money, but I hated that camera for a long time because I wouldn't have had it, I wasn't allowed to touch it when he was alive. He was like get away from my camera. And he died and now I get to touch the camera. And so that, I get that anxiety around that. So that's really fascinating that it showed up in her dream because when you started telling that story and none of us listening had any idea that he was this nice loving man, I was like, oh, they must have had this really awful relationship. And it's like, no, but it was about that benefit because we don't want to feel like we have gained from somebody. Joshua Black: 45:23 No, it's so true. Yeah. That's amazing. You can relate to the camera. Joshua Black: 45:28 Oh, absolutely. Yes. Joshua Black: 45:30 And that goes on talking about a lot, I believe when it comes to death and dying about, yeah. Like you've got some stuff, but that can be very distressing for you to carry. Heather Stang: 45:40 Right. So I am curious, and I'm sure everybody listening is curious because I bet we've just touched the surface of this really clearly prolific topic. If you know, 84% or 86%...this is not an uncommon experience, where can we learn more? Tell us about your podcast too. Joshua Black: 46:09 So the podcast is great because the one thing about doing the research that I didn't like was I was just collecting these dreams and some questionnaires, we don't really get the full story, you know, that qualitative sort of analysis of what's going on and to ask questions about their experiences. And so that's the base of the podcast was birthed out of, is that sort of desire to talk to people about their life journey, their loss, and then also these dreams that they may or may not have had. And most people, as you said, like we'll have these dreams. So it's amazing to have these conversations with people, and sometimes they only had one dream and they talk about how life changing was, other times it was a series of dreams and how they've changed over time. And so at the end of the day, if you love dreams or you love talking about grief, I think it's a great show to, to check out, listen to and see if you like it. Because everyone has a different way of talking about loss and grief. And I tend to find that when it comes to our show, we want make it uplifting in a way, because there are the grief podcasts out there for education, and for the sorrow of grief, you know, like really getting into the deep of it, and the way we wanted to do it was almost like a refreshing look at your life and that grief is a part of life. Grief isn't all of life, and to see that fluctuation and then also how people sort of maneuver through that, and how these dreams sometimes can help or hinder them if they are negative. So we've had a couple of negative dreams on there too, so we don't, we don't pick and choose. Heather Stang: 47:43 And I imagine too, just, it's always so helpful to hear other people's stories of love and loss because it lets us know we're part of a bigger tribe. Joshua Black: 47:51 Yeah, that's so true. And I don't know about you, but every time I do a podcast, I get so uplifted. Like I feel like a million bucks. Like it's better than coffee, my podcast. Heather Stang: 48:02 Well, I don't know if I'd say it's better than coffee, but it's close. Joshua Black: 48:06 Close second? Heather Stang: 48:07 Close second. You're right. Because part of why I imagine you do this work and why I do this work is because of our own stories. For you, your father. For me, my uncle and my stepfather. We do this because our own hearts were broken and it feels really good to connect with other people who get it. And, and I love getting to talk to you because again, this is such an important area. It surprises me that it was not looked at sooner, but I'm so grateful that you are looking at it and I know many people listening will benefit and now understand answering that question, why don't I have dreams or why do I have the negative dreams? You're going to provide a great comfort to many people. Joshua Black: 48:52 Aw, thank you. At the end of the day, that's the hope. And that's the reason, you know, we do what we do is to provide and normalize the grief journey as best we can for people who are seeking. So, you know, kudos to you too for having this podcast and allowing people to learn a little bit more about grief on their journey because it's not, you don't really go to school, you know, for grief and we're not really taught about it. And so that's a big thing with children also in schools are not taught about it. And that's why it's up to the parents and the caregivers to really sit down and talk about death with them and talk about these dreams that they have them. Heather Stang: 49:25 So in a sentence or two, speaking of children, can you give us a summary of your books without giving away the plot? Joshua Black: 49:39 The best way to put it... It's okay to cry. It's okay to love, you know, I can smile. So like that's about like the whole thing. It's normalizing the whole process. And people can go to the podcast or they can reach out to me and to chat more about this stuff. I always love hearing these dreams. Heather Stang: 49:54 What's the best way to contact you? Joshua Black: 49:57 Through the email is the best way. Just go to http://griefdreams.ca. Or if you want everyone to see your dream, you can go on the Grief Dreams Facebook Page and post it there. Heather Stang: 50:06 Wonderful. Well any closing words before we sign off from this excellent conversation? Joshua Black: 50:13 I think it's good. I think at the end of the day there's a lot more I could say on the topic when it comes to cultural differences. Everything, you could have another podcast with me on it, but at the end of the day, I think it's great like intro to normalize the experience for people and to maybe just open up the conversation. Heather Stang: 50:31 Okay. We are going to book you for phase two, cultural differences of dreams, which I think will be amazing. But for now, I thank you so much, Dr. Joshua Block for your time and your research and your wisdom. Joshua Black: 50:46 Thanks for having me. Heather Stang: 50:47 Thank you. Namaste.